This dome shaped cake is a 1st for me and composed of 8 components!! It has a beautiful name - Cité Jardin - city garden, giving hints of all the beautiful red, green, brown hues. It is the work of Yoshiya Inoue of Puissance located in Japan. 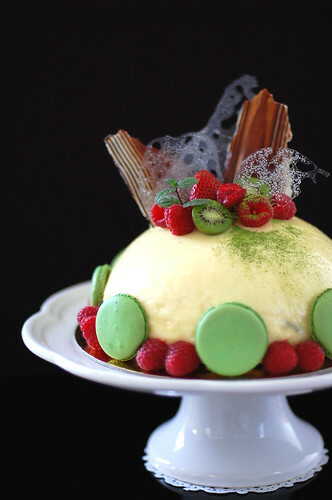 His original composition was of pistachio dacquoise/pistachio crème brûlée/confiture de fruits rouges/white chocolate mousse/white chocolate glaze but since the pistachio paste I ordered was on back order, I opted for a different composition. When one look at the components, it may look busy with all the different ingredients but they were actually quite subtle. 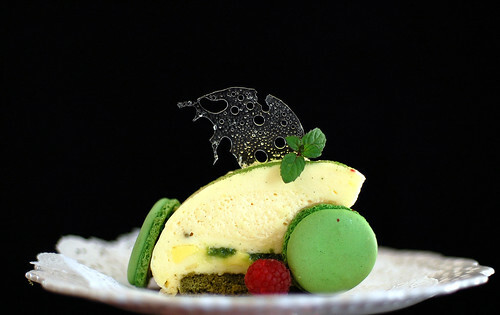 The exotic taste of saffron-infused crème brûlée, the subtle bitterness of matcha génoise, chewy macarons gives it a very contrasting texture and all these flavors work wonderfully together. Though the mousse and baravois was surprising light to me but it may taste rich and creamy to some so serve more raspberries on the side to cut the creaminess. The cake can be baked a day in advance. Once cooled, cut out a 13mm/½in thick and 16 ½cm/6 ½in diameter round. Wrap with food wrap and store at room temperature. Place the saffron threads in a small bowl, add the boiled water and let steep for 5 minutes. Pour the saffron-infused water and saffron into a small saucepan, add in the milk and heavy cream, heat over medium heat to just boiling. Remove from the heat, put the lid on and let infuse for 10 – 15 minutes then strain the mixture. Preheat the oven to 240°F/120°C. Whisk together the sugar and egg yolks till pale in color, then pour the saffron-infused milk over the sugar/yolk mixture, whisking constantly as you pour, and mix until combined. Place a napkin over the mixture to soak up the bubbles that formed from whisking. Pour into the pan, place it into a large roasting pan then pour hot water into the roasting pan all the way up half way of the pan and bake for about 40 minutes or until firm on the edges and slightly wobbly in the center. Let cool then chill in the fridge for at least 1 hour or overnight until firm up. - Line a 19cm/7 ½in half sphere mold with food wrap, press firmly onto the mold to push out air bubbles, leave a 2in/6cm tail outside the mold. Place the gelatine in icy water, soak until soften, squeeze out the water, set aside. Place the chopped chocolate in a heatproof bowl then place it over a pot of simmering water, stirring constantly until completely melted. Place in a warm water bath to keep warm. Bring the milk to just boiling then remove from heat. Using a hand mixer, whisk the egg yolks and sugar together in a large mixing bowl, slowly pour in the hot milk mixture, whisking constantly until combined. Return the mixture to the saucepan and cook over low heat until thicken and the temperature reaches 170°F /85°C, about 2 minutes. Add the pre-soaked gelatine, mix well then using a rubber spatula, fold 1/3 of it to the melted chocolate mixture and mix well. Fold in the remaining egg mixture until incorporated. Set the bowl in an icy water bath to cool. Whip the cream until soft peaks form. Fold 1/3 of it into the chocolate mixture, mix well then fold in the remainder of the whipped cream until incorporated. Using a hand mixer, whisk the egg white until foamy then gradually add in the caster sugar, whisk until stiff peaks form. Fold 1/3 of it to the chocolate mixture, mix well then fold in the remainder of the meringue until incorporated. Pour into the prepared mold and slightly tap it on the counter to release air bubbles. Chill in the fridge for at least 2 hours or overnight. Pour the mousse into a piping bag without a tip, set aside. The glaze jellifies quickly, you should make it at the last minute. - Pre-soak the gelatine, set aside. Place the chopped chocolate in a heatproof bowl then place it over a pot of simmering water, stirring constantly until completely melt. Bring the milk and corn syrup to a boil over medium heat, stirring constantly to avoid burning the mixture. Pour the hot mixture into the melted chocolate, using the rubber spatula, stir until completely incorporated, add in the pre-soaked gelatine and mix well. Let cool while checking the texture regularly. As soon as the mixture is smooth and coats a spoon well, use immediately. - On the back side of 2 parchment papers, trace 3cm/1 ¼in circles about 3cm/1 ¼in apart. Flip them over and line the baking sheets. - Prepare 2 sheets of foil the size of the baking sheets. - Must let the piped cookies sit out until dry to touch before baking to prevent them from cracking during baking. Sift together almond flour, matcha, and powdered sugar twice then place the mixture in a large mixing bowl. Add 55g egg white to the flour mixture and stir until it forms into a sticky ball, set aside. Heat water and caster sugar over medium heat until it thickens and reaches 230°F/116°C. While the syrup is heating, begin whisking the egg white at high speed in the bowl of a mixer using the whisk attachment; whisk until pale and foamy. Reduce the mixer speed to low speed and begin slowly (very slowly) pouring the syrup down the side of the bowl being very careful not to splatter the syrup into the path of the whisk attachment. Some of the syrup will spin onto the sides of the bowl but don’t worry about this and don’t try to stir it into the mixture as it will harden! Raise the speed to medium-high and continue beating until it becomes thick and satiny and the mixture is cool to the touch, about 5 minutes. Add in a drop of green food coloring, fold until incorporated. With a rubber spatula, fold 1/3 of the meringue into the almond/sugar/matcha flour mix, fold until incorporated then fold in the remaining meringue and fold until completely incorporated. With the rubber spatula, scoop and spread the batter, in a full circle, on the inside wall of the mixing bowl. Repeat this scoop & spread process also known as macaronnage, for a total of 15 times. Lift some batter with the spatula, it should falls into the bowl in a ribbon fashion, and has a glossy look. Pour the batter into a piping bag with a round tip and pipe the batter from the center of the drawn circle onto the baking sheets. Pipe about 60 circles. Let dry at room temperature for 30 minutes before baking to allow skins to form. Meanwhile, preheat oven to 400°F/220°C, with racks in upper and lower thirds. When the batter is dry to the touch, place into the preheated oven and bake for 2 minutes, then quickly turn it down to 300°F/150°C, bake for 5 minutes, then rotate the baking sheets (upper and lower racks), cover the sheets with foil, and continue to bake for 5 minutes. Remove from oven and transfer to cool on the cooling rack. 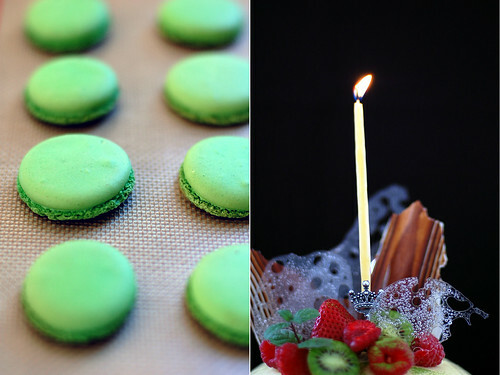 Once cooled, slide a knife (fragile, must be careful) underneath the macarons to remove from the parchment paper. Chop the bittersweet chocolate into tiny pieces and place into a dry heatproof mixing bowl. Temper the chocolate by melting it in the microwave. Need to do it on medium for 4~5 times and at 30 second interval. Stir the chocolate each time the microwave stops until becomes completely melted and smooth. Cool for 2 minute. Spread out a few 2.5x14in/6x40cm acrylic strips on the back of a jelly roll pan. 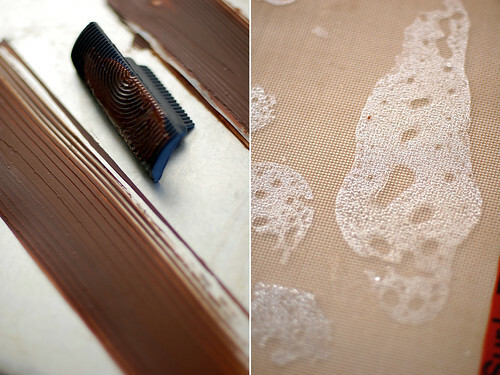 Dip the pattern side of the wood grain comb into the chocolate, and draw the pattern on the acrylic strips. Chill in the fridge to set. Melt and temper the white chocolate using the same method as above. Let cool to touch then spread the melted chocolate evenly with a spread knife on top of the chilled chocolate pattern. Place in refrigerator to chill and set. Carefully peel off the chocolate and break/cut into desired size. Preheat oven to 360°F/180°C。Sprinkle the Isomalt sugar evenly on a jelly roll pan lined with silpat silicone sheet, place another silpat sheet on top, and press it down lightly. Bake for 5 minutes, remove from oven, press it lightly using a rolling pin then return it to the oven and bake for 5 minutes until sugar completely melted. Let cool completely then break/cut into desired size. - Line your mold with food wrap, press firmly onto the mold to push out air bubbles, leave a 2in/6cm tail outside the mold. - Cut the saffron crème brûlée into 16 ½cm/6 ½in round. 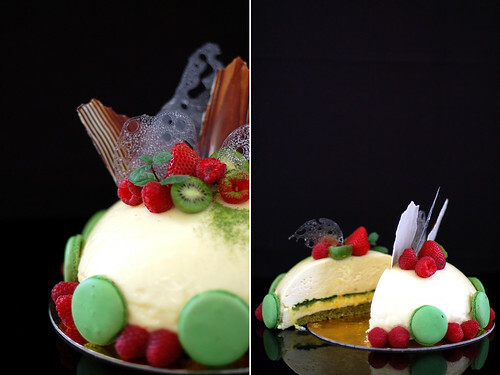 - Cut the matcha génoise into 16 ½cm/6 ½in round. THIS IS FOR UNMOLDING FROM UPSIDE DOWN TO RIGHT SIDE UP. You will want to tap your mold gently on the countertop after each time you pipe mousse in to get rid of any air bubbles. Snip off a little corner of the piping bag with the mascarpone mousse, pipe to about 1/3 height of the mold, spread evenly. Push the bavarois filling into the mousse; it will fill to 2/3 full. Pipe another layer of the mascarpone mousse, place macaron halves on top, then the saffron crème brûlée insert, another layer of mascarpone mousse and then top with the matcha génoise (syrup side down) round, press lightly. Chill in the fridge to set for at least 3 hours or overnight. Unmold the cake by grabbing the food wrap and carefully pull upward. Once loosen, turn it out on a wire rack. Make the glaze now. Place the cake along with the rack over a large baking pan, pour the glaze on top and let flow down to cover the entire cake. The glaze jellifies quickly so work fast; let set for 30 minutes in the fridge. 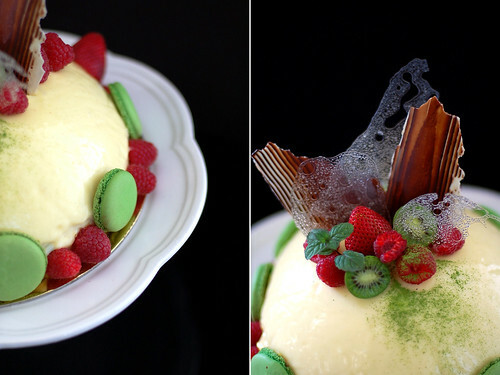 Cover the entire side of the cake base with a pattern of 1 macaron half & 2 raspberries. 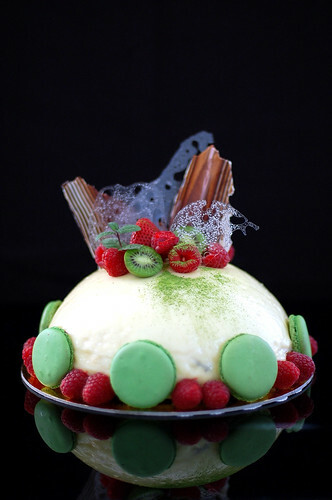 Place the chocolate and sugar decorations at the top of the dome then arrange some fresh fruits like strawberries, raspberries, kiwi berries and mints on top then a dust of matcha powder. Isn't it gorgeous? 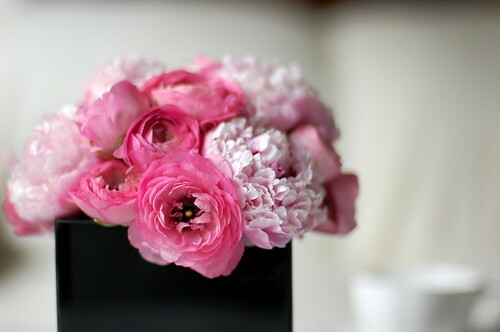 This gorgeous arrangement is the topper on a cake that Mei made for my birthday. Mei is the owner of this lovely flower shop. J'ai envie de dire que le nôtre peut aller se rhabiller ! C'est de toute beauté ce birthday cake ! Waouw, impressionnant, la classe international ! C'est du boulot de pro ! Je suis bouchée B tellement c'est somptueux ! Ce site est une vraie merveille ! Bravo et des photos digne de grands photographe ! Avant d'aller dormir, recevoir le flux rss est un pure bonheur ! How beautiful!!!! I badly want to make something like that but have always been too lazy. Really, 8 components could literally take me a week to complete! What a wonderful birthday cake! And happy birthday too, of course!! I love!! Oh my goodness, that is soooo gorgeous! I love the colors and the shapes. It sounds like it tastes incredible, too. Beautiful! Happy birthday to YOU!!! is gorgeous!!! Happy Birthday to u!! Happy Birthday...the cake looks great. I love the photos. 來遲了!! Happy Birthday to you !!! Wish all ur dreams come true! :) Your cake is so beautiful! 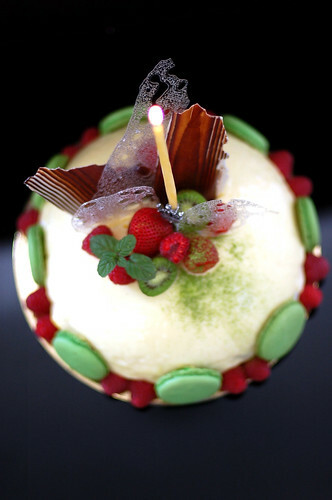 Happy Birthday Vi, I wish u a healty and wonderful year ;) Your cake is... Excellent, and sooo Beautiful! Happy Birthday!!! I enjoy your blog immensely and all the wonderful things you have been sharing to all of us here, over the cyberspace! I sincerely wish you a beautiful birthday with friends and family. You're truly an artist, one-of-a-kind! This is just such a stunning cake! I love it! ps : 嘩, 食／睇過妳嘅蛋糕♥♥, 會否對其他蛋糕有厭食的傾向呢 ?? Christy – It took me 2 days to complete! It was easy to assemble once I get most of the components completed. I won’t do this anytime soon though…. this is so pretty and full of pleasure! Belated Happy Birthday! Hope you don't mind it's a bit late! Wow, it looks very elegant. I like it.. The color and the style was good. Keep it up. Thanks for sharing.